The Texans hung admirably tight with the Patriots in Foxboro, losing 27-20, but you can’t say they didn’t have their chances to outright win the thing. 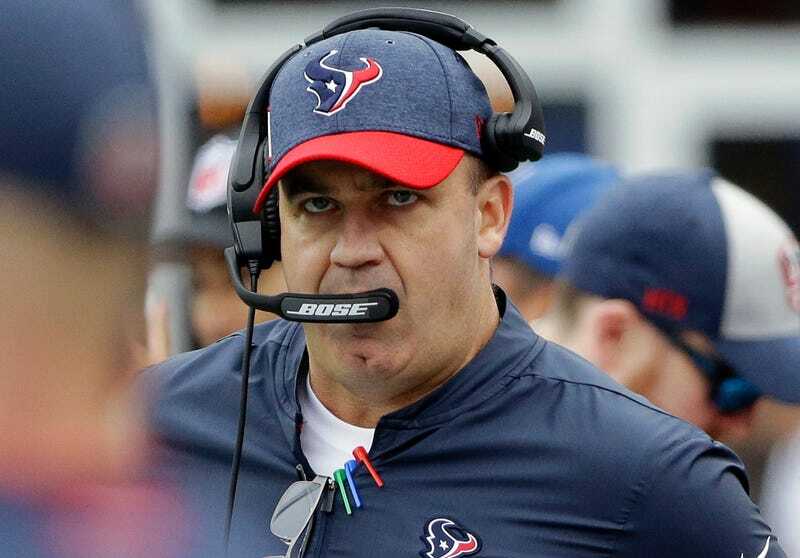 And a whole lot of the blame for that falls on head coach Bill O’Brien, who was responsible for some iffy fourth-down decisions, a brutally lackadaisical late drive, and one major abdication of responsibility. Let’s go to late in the second quarter, with New England up eight and looking to make it a two-score game before halftime. Tom Brady completed an impressive throw to Rob Gronkowski in double coverage for 28 yards. 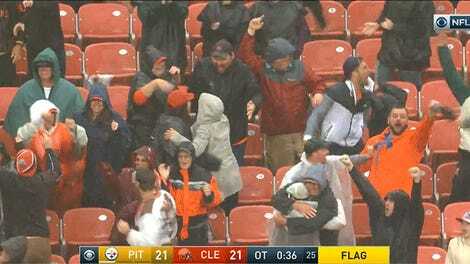 Except, was it a catch? It appears that it was not. Certainly close, but that ball spent an awful lot of time nuzzling the turf. Because there were under two minutes left in the half, the Texans were not allowed to challenge the play; a decision to review comes from officials, specifically the replay office in New York. Knowing this, the Patriots hurried to the line to snap the ball. Also knowing this, Bill O’Brien could have called a timeout to give officials time to initiate the review. He did not. Despite the defensive backs immediately signaling an incompletion, and even Jim Nantz openly calling for O’Brien to call a time out, he did nothing, and the Patriots got the next play off before the New York office could order the review. Five plays later, the Patriots would reach the end zone and head into the locker room up 21-6. When asked about the sequence after the game by the Houston Chronicle’s John McClain, and why he didn’t call a timeout to give officials time to start the review, O’Brien got pissy. “It’s not my job to do that,” O’Brien said. And then, again: “It’s not my job to call a timeout to make their [the officials’] job easier.” Except, yes. It 100 percent is. Any coach in this league worth his salt knows this, and calls that timeout. It is a situation that crops up pretty frequently—there’s a reason the Patriots were hustling to get the next play off—and coaches know they must make the decision on whether burning a timeout is worth the reward. It almost certainly would have been here. The non-timeout almost—almost—overshadowed O’Brien’s questionable decisions in the second half, like choosing to go for it on fourth and 5 at the Patriots’ 17, when down 15 points with 10 minutes still left in the third quarter. Or choosing to punt from his own 36 when down 14 points with 4:41 left in the game. Or, worst of all, somehow managing to make a six-play drive last 2:24, at a time the Texans were down two scores with four minutes and change left. O’Brien is calling the offensive plays again this season, so any lack of urgency on that drive is his responsibility. The Texans would score to make it a seven-point game, and would get the ball back, but with not enough time to even advance beyond midfield. The Texans are 0-1 after a season opener they weren’t expected to win, but one which everyone watching knows they absolutely could have won. “It’s not my job,” is the sort of quote that sticks to a coach. I have a feeling it’ll be brought up again when it is literally no longer O’Brien’s job anymore.